Doujinshi-Ka’s Inbox: When is Shine going to get to the Millennium attack? Doujinshi-Ka’s Inbox: When is Shine going to get to the Millennium attack? 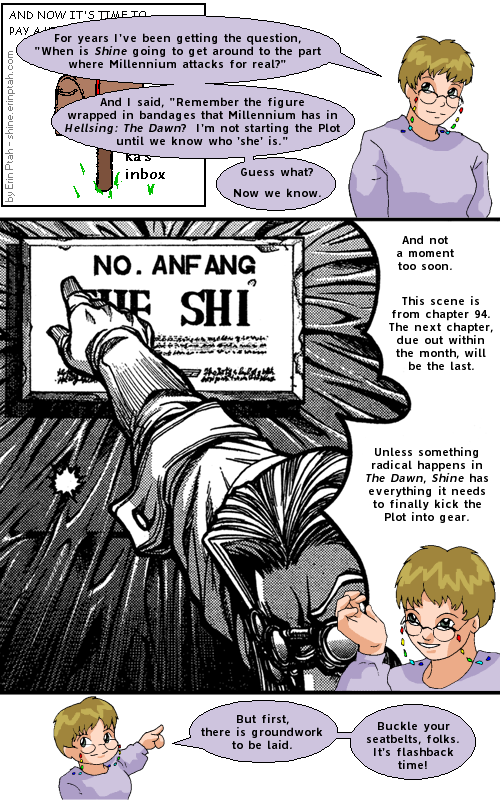 published on 14 September 2008 Read more posts by the author of Doujinshi-Ka’s Inbox: When is Shine going to get to the Millennium attack?, Erin Ptah1 Comment on Doujinshi-Ka’s Inbox: When is Shine going to get to the Millennium attack? Erin: For years, I’ve been getting the question, “When is Shine going to get around to the part where Millennium attacks for real?” And I said, “remember the figure wrapped in bandages that Millennium has in Hellsing: The Dawn? I’m not starting the Plot until we know who ‘she’ is.” Guess what? Now we know. And not a moment too soon. This scene is from chapter 94. The next chapter, due out within the month, will be the last. Unless something radical happens in The Dawn, Shine has everything it needs to finally kick the Plot into gear. But first, there is groundwork to be laid. Buckle your seatbelts, folks. It’s flashback time!